Are You Settling For Web Scanners? You probably know that most website visitors don’t read word for word. While there are the rare readers, you may have accepted that your visitors will not spend long on any page. That’s just the sad nature of the beast. Have you considered, however, that web visitors’ low attention rate may be a self-fulfilling prophecy? Marketers expect it and don’t strive for more. But hasn’t marketing always been a battle for attention? Perhaps we can do better. Why do you write anything in the first place? Because you want your target audience to read what you have to say. The more they engage with content and copy that’s relevant to your message and offering, the more likely they are to convert. Site visits will not yield fruit unless your visitors linger awhile, giving you their undivided attention. So whatever attention spans you’re dealing with, fishlike (we’ll get to that later) or above, you want to extend them. Yes, the last goal is lofty. But if you can get a scanner to engage more deeply with the content that’s highly relevant to him or her, you’ll be closer to your conversion goals. So let’s dig a little deeper into how web visitors read (or don’t read) web content, and how to write for them whatever their reading style. 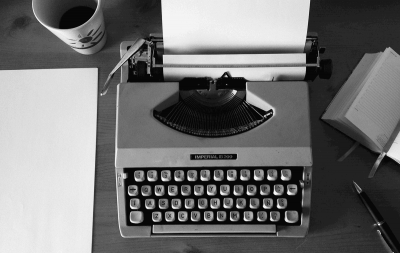 For every ten words you write, how many are your web visitors likely to read? According to a study by Nielsen Norman Group, a meager two or three. Data that Harald Weinreich provided supports their study. It tracked the time visitors spent on almost 60,000 page views with different word counts up to 1,250 words. (They thought that pages with higher word counts were not “real” pages—just privacy policies, etcetera. Apparently they had not discovered the allure of the long-format post on the Crazy Egg blog!). 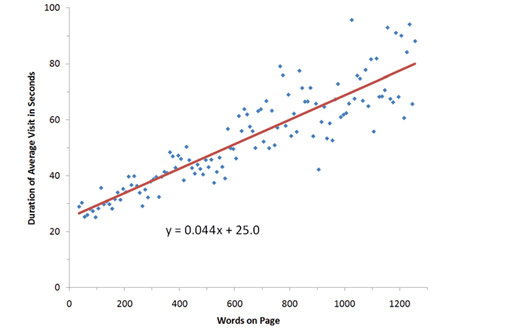 They found that the more words, the more time people spend on a page. The catch? They hang about only 4.4 seconds longer for each 100 words. A little math is in order. At an average reading rate of 250 words per minute or 4.16 words per second (assuming a reasonably literate reader), visitors are reading about 18 out of 100 words… a mere 18% of what’s on the page. Why Are Attention Spans So Short? Microsoft wondered if technology was the culprit and asked, “How is technology impacting attention spans?” To satisfy their curiosity, they invested in quantitative and neurological research. 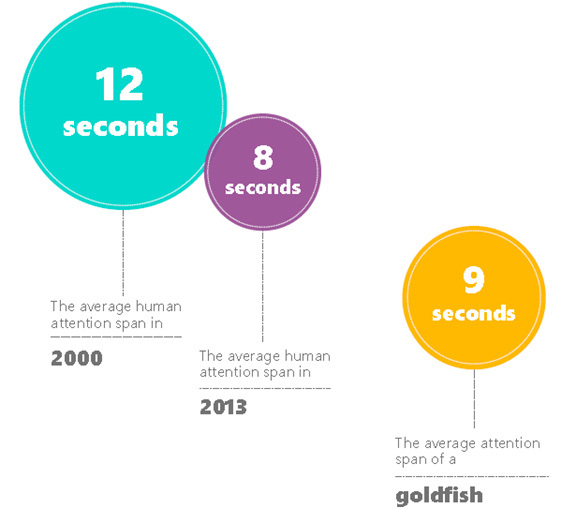 They discovered that the attention span of an average human in 2013 was 8 seconds. It had shrunk from 12 seconds in 2000 to less than that of a goldfish (9 seconds). I’m not sure how they measured the focus of the fish. No matter. Our attention is short. Parsing the data further, Microsoft looked at early adopters versus those who floundered into technology later in life and discovered that early adopters had shorter attention spans. As we watch Millennials flit from one piece of technology or web page to the next, that lack of focus is likely no surprise. What may be more unexpected, however, is that Millennials have an edge not seen in their Baby Boomer parents—more bursts of high attention. Our gray matter adapts to its environment. Clearly, technology has made its imprint. As a marketer, you also need to adjust your approach to your audience. When you create web content, you want to harness that surge of concentration. To grab and hold their attention, you need to use all the tools in the toolbox. We’ll get to that soon. First, let’s explore the exception to the rule—the rare readers. 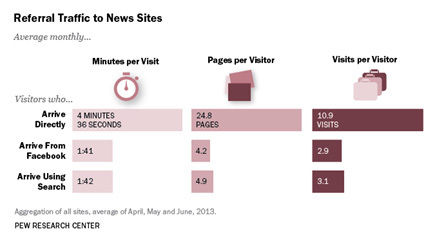 The Pew Research Center studied Internet traffic to 26 of the most popular news websites. Their analysis revealed that people who type in the URL and visit news sites directly actually read the content. Interestingly, this does not apply to those who land on the site via a Google search or Facebook. No one knows how this research applies to direct visitors to other types of sites such as those practicing content marketing. I do, however, have a theory. The Way People Arrive On A Site May Provide Some Indication Of Their Intent. If you type in a URL, you’re being purposeful. Just like you used to sit down, relax and read the newspaper on Sunday mornings, you likely have carved out some time to read. Search visitors, on the other hand, are seeking answers to questions. They either find them and are satisfied, or they scan the page, find nothing relevant and bounce off the site to continue their quest. Finally, visitors who were referred to a site via social media are stumbling across content in a more impulsive way, so they may not be highly committed to reading it. Perhaps they’re just seeking a little light entertainment or edutainment. Then the next shiny object catches their eyes. It’s likely that direct visitors are readers while search and social media visitors more often are scanners. How can you keep all these readers with different intents, who land on your site purposefully or otherwise, happy and engaged? To awaken the interest of scanners and keep them on your website as long as possible, you need to make it easy for them to find the answers they seek. Latch Onto That Surge Of Attention. 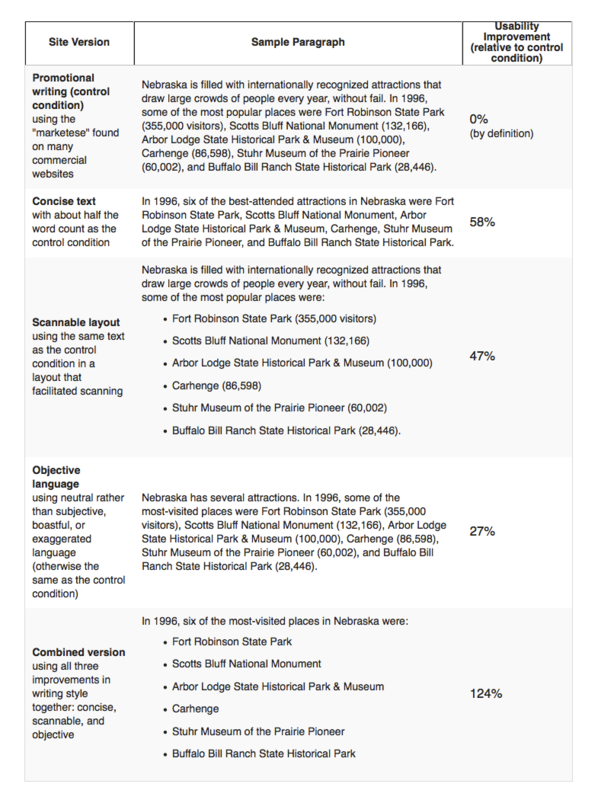 A Nielson Norman Group study showed that making copy concise, scannable and objective improves readability. With these changes, people find answers more rapidly, recall information better and are more satisfied. Why does it help to slash excess words and extraneous thoughts? Let’s go back to our friends at Microsoft for their observations. Just as it’s easier to walk through the woods when the undergrowth has been cleared, it’s simple to read when you’re not sorting through a dense tangle of words. Whatever you write, make a goal to prune 15 to 20 percent of the words. What about the role of bullet points? If you highlight the most important words with bullet points, it’s like having landmarks on a map that help you find what you’re looking for more rapidly. 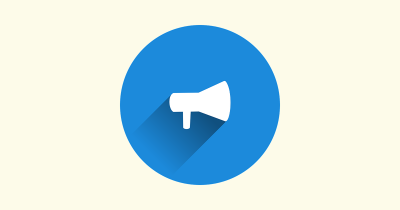 Besides bullet points, how can you make your content concise and easy to scan? Use techniques that enable readers to focus on what interests them and prioritize what they read. By doing so, you’ll encourage them to scroll and dig deeper into your content. A little more about those chunks. Most likely, you were taught to use paragraphs in school. But the rules have changed. How you chunk your writing dictates the cadence of your content, emphasizing some words over others. Chunking is not about grammar. It’s about style, readability, making your content alive and scan-friendly. Words alone do not create readability. The look and feel is another essential piece of the puzzle. How easy is the presentation on the reader’s eyes? Often, what’s not on a web page is as important as what is there. Readers don’t want to fight through a wall of words. They want the welcome relief of white space. Everything is easier when you know where to start. That includes reading. For this reason, you should align your text to the left. Go straight, not ragged. It gives the reader a starting point for each and every line. 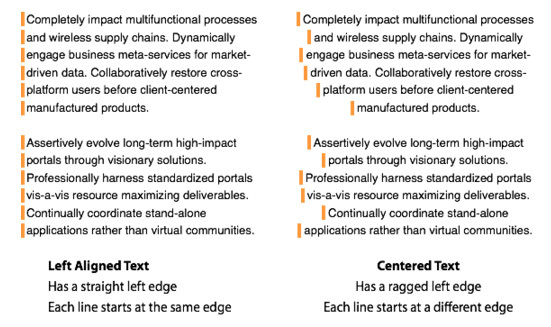 As you can see in this image from UX Movement, it’s easier on the eyes. As always, there are exceptions to the rule. Center alignment can help to highlight short text such as headlines and quotes. Ninety percent of information transmitted to the brain is visual, and visuals are processed 60,000X faster in the brain than text. (Sources: 3M Corporation and Zabisco). So include relevant visuals that help readers to grasp information quickly. Marketers used to worry about dipping below the fold on websites (the area people cannot see without scrolling). They had good reason for concern. Back in 2010, a Nielsen Norman Group study discovered that users spent 80% of their time above the fold on a website. However, times are a-changing. Huge conducted limited user testing (48 participants) and found out that almost everyone was scrolling. Some start scrolling immediately, showing there may no longer be any prime real estate on a web page. You’ve done everything you can now to make your content easy to read. There is, of course, one more ingredient. It must be worth reading. If possible, provide unique information. If not, at least tell the story in a way that it’s never been told before. Look at it through a new lens. 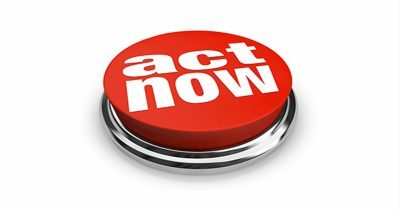 If you reward your reader for the time they spend on your web pages, they will give you their attention. So, make it an easy read by weeding out jargon and big words. Keep sentences short. Use power words to draw people in emotionally and hold their attention. And don’t be dry or bland. Use metaphors, analogies and similes to make abstract concepts tangible. Inject your personality and sense of humor where appropriate. In everything you write, there is a story and a sub-story. Highlight the sub-story with bolding/bullets and other tactics we discussed. It is the skeleton designed for scanners. The readers will go beyond these bare bones, reading the words that fleshes them out. Give readers some meat—some substance that’s helpful, informative, fun, educational and unique. Add a strong backbone of facts and examples. Using these techniques, you are likely to convert more scanners into readers. At a minimum, your goal should be to have them reading word for word the sections of your content that interest them the most. You’ll also have more readers savoring your content from beginning to end.